We’d love your help. Let us know what’s wrong with this preview of Rise of the Evening Star by Brandon Mull. To ask other readers questions about Rise of the Evening Star, please sign up. how do i get to read it online? All of your books are very realistic and very open , minded who else agrees ? 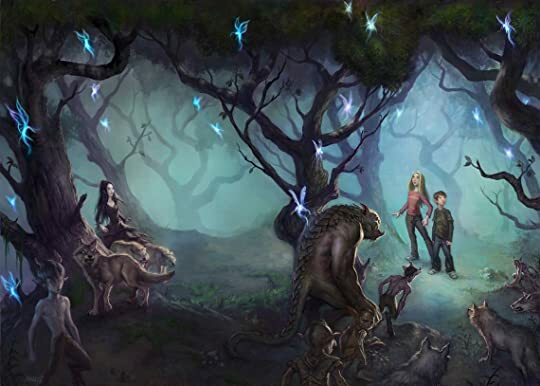 While the world-building in the first book was incomplete and unrefined, here the magical world of Fablehaven begins to unfold, as well as Kendra's special abilities. Colorful and varied magic is created in Rise of the Evening Star: the mystical creatures, the magical items are written with so Rise of the Evening Star, the second book of the Fablehaven series is more dynamic and more complex than the first one. More mysteries, more adventures take place, and keep you engaged throughout the story. My first venture to the magical world of Fablehaven was truly an unforgettable one. I just couldn’t stop raving about it to every bookish person I know. Truth be told, I read Harry Potter series because a number of critics and authors compared Fablehaven to it(and yes, I just read Harry Potter this year. Please, don’t kill me.) I wanted to prolong the pleasure in reading the entire Fablehaven series so I didn’t read the 2nd book immediately after the 1st one. I finally decided to revisit Fableha My first venture to the magical world of Fablehaven was truly an unforgettable one. I just couldn’t stop raving about it to every bookish person I know. Truth be told, I read Harry Potter series because a number of critics and authors compared Fablehaven to it(and yes, I just read Harry Potter this year. Please, don’t kill me.) I wanted to prolong the pleasure in reading the entire Fablehaven series so I didn’t read the 2nd book immediately after the 1st one. I finally decided to revisit Fablehaven because I wanted to read something magical, just in time for the holiday season. The Sorenson sibling are on their last days of the the school year, but for Kendra it isn’t as easy as she thought it would be. There’s suddenly a new guy in her class and every girl thinks that he’s uber hot. Kendra thought the joke’s on her because what she sees is a boy with hideous features, someone comparable to a goblin. She realized that it was indeed a goblin and of course, she’s the only one who can see it as she’s the only one who has the ability to see past through the magical veil that deceives the normal human eye, an ability she received from the fairies on her first visit to the Fablehaven. Kendra, knowing that the goblin is up to something mischivous, seeked the help of her smart-mouthed, drastic younger brother, Seth. As she expected, Seth can offer nothing other than his sarcastic remarks. When a mysterious man named Errol shows up, offering his help to eliminate the goblin, they reluctantly accepts it. Kendra and Seth didn’t know that the eliminating the goblin is only the first in the chain of events that will lead them to spending another summer at Fablehaven. Another summer filled with magic, schemes, betrayals, and Seth messing up with the creatures mainly setting up a C-size battery-to-gold exchange business with the satyrs. What I love the most about Fablehaven is how easy it is for Brandon Mull to break, crumble, and pound the wall that separates reality and fantasy. Before I know it, I was completely suckied into the land of Fablehaven filled with both colorful and sinister creatures. The rules he set on his fictional land are just wickedly cool. Fablehaven, a magical creatures preserv e, is certainly one of those fictional places – along with Hogwarts, Camp-Half Blood, etc., – that will make you wish that they really exists. Brandon Mull really do tests and expands the boundaries of the reader’s imagination. Seth and Kendra is a very powerful tandem, too. I know we’ve already seen a lot of siblings whose hobby is to bicker in fiction, but Seth and Kendra by far is my favorite. They just compliment each other perfectly. Seth’s naughtiness and immaturity balances well Kendra’s goody good attitude, while Kendra’s doubts and uncertainties balances well Seth’s admirable, daredevilish bravery. The plot are no less superb. It was a tad bit darker than the first one but definitely more engrossing. The solution to the whoddunit mystery going on isn’t a giveaway. We’re at the same pace on unveiling the culprit as the characters in the book, unlike other fantasy novels in which we’re always two-steps ahead. The surprises hidden on Brandon Mull’s sleeve is seemingly infinite and he just keeps pulling one until the very last page. This careful plotting of the mystery produced a solidly characterized culprit. The culprit was three-dimensional, and being a huge sucker for well-characterized ‘villains’, I am satisfied. Shelf of favourites make some space! This lovely little series has to fit in there! I liked book one in the Fablehaven series and loved this one. The action is nonstop, the story is great, and the are many magical items (who can say no to that). Kendra is still a great character: smart, careful, good. Seth is less annoying than in book 1. He's a year older. And there are some really interesting new characters: both good and bad and good-bad :). in the first book it's meet and great to all the wonders of the world. in this book we see the villian arise. จะว่าก็ว่านะ ... เซธน่ารำคาญน้อยกว่าเล่มที่แล้ว แต่ก็ยังมีมุมให้น่าตบกะโหลกอยู่อีกเหมือนกัน ส่วนเคนดร้าฉายเดี่ยวในตอนท้ายแบบเล่มก่อนอีกแล้ว สงสารเซธเลยงานนี้ ชวดบทสนุกส่งท้ายอีกตามเคย 555 รอดูว่าเล่มหน้าเซธจะได้ฉายเดี่ยวตอนท้ายเล่มบ้างมั้ย ภาพรวมแล้วหนังสือเล่มนี้สนุกขึ้นนะ แต่ยังไม่สามารถแตะถึงอารมณ์เราได้ คงอาจจะเป็นเพราะหนังสือเด็กหรือเปล่า ผู้แต่งเลยไม่ได้ลงลึกตรงส่วนนี้มากนัก ? Kendra and Seth can't wait for the end of the school year so that they can return to visit their grandparents at Fablehaven. A few days before the school year ends, a scabby kobold appears in her class. The kobold appears normal to everybody except Kendra. With the aid of a kobold exterminator they get rid of him and are then swiftly evacuated to Fablehaven for their own safety. Once there, they find out that the Society of the Evening Star (which opposes preserves such as Fablehaven) has gotten Kendra and Seth can't wait for the end of the school year so that they can return to visit their grandparents at Fablehaven. A few days before the school year ends, a scabby kobold appears in her class. The kobold appears normal to everybody except Kendra. With the aid of a kobold exterminator they get rid of him and are then swiftly evacuated to Fablehaven for their own safety. Once there, they find out that the Society of the Evening Star (which opposes preserves such as Fablehaven) has gotten stronger and may have even breached Fablehaven itself. Satyrs, Narcoblix, Brownies, fairies, Weird Puppet intertwine with deceit, betrayals and non stop action makes this second installment even better than the first. I can't wait to move unto book three. Usually people have a special book or a series that ‘got them into reading’. I am lucky enough to be able to say that I’ve always been a reader (which sounds like I’m bragging for some reason, but I’m not trying to). There’s not a period in my life that I can remember when I didn’t have a book in my hand! But with that being said, there are definitely a few series from my childhood that stand out and that played a major role in my love of books. One of those series was Mull’s Fablehaven saga. Go Usually people have a special book or a series that ‘got them into reading’. I am lucky enough to be able to say that I’ve always been a reader (which sounds like I’m bragging for some reason, but I’m not trying to). There’s not a period in my life that I can remember when I didn’t have a book in my hand! But with that being said, there are definitely a few series from my childhood that stand out and that played a major role in my love of books. One of those series was Mull’s Fablehaven saga. God, this series is just gold! I know that for some unseeable reason it has received a lot of negativity, but this is one of the most cleverly written middle grade series out there. The characterisation is some of the best that I’ve ever read. Each and every single character - no matter how major/minor they are in the over-arching storyline - are completely fleshed out. They are all complex and three-dimensional with the perfect blend of realistic positive and negative characteristic. They set themselves apart from each other without being oddly distinctive. I love that there is a lot of subtle diversity in ethnicity and nationality, and that Mull wasn’t scared to write characters who were kind of flawed. Coulter, for example, could be caring and funny in a grandfatherly sort of way, but is also mildly sexist. He grew up in a time where sexism was much more the ‘norm’ that it is now and admits that he is sort of ‘old-fashioned’. Why this can be a little frustrating for Kendra/Grandmother/Vanessa, it makes him such a well-rounded character. He isn’t perfect because perfect people don’t exist, and Mull does this with all of his characters. I don’t know how, but not matter how long we spend with the characters. Warren - Dale’s brother - was also introduced into this novel, and I simply adore him. I love that he treats Kendra and Seth with the respect that they have earned. Also, Tanu! I really wanted to get to know him more. I just… I really, really love how Mull deals with characterisation, if you couldn’t tell. And the plot in this sequel was just fantastic too. The first book is a little bit introductory when you look back on it, but Rise of the Evening Star certainly steps up the game. It introduces us to what will be the major focus of the series (which I won’t say to avoid spoilers) and it is fast-paced and enthralling throughout the whole novel. The puzzles are realistic but still nail-bitingly paced and exciting. I loved exploring more of Fablehaven and this ‘world’. I liked the sequel to Fablehaven even better than Fablehaven itself. The author was able to flesh out the characters and each gained a lot of depth. They’re fantasy, not unlike Harry Potter but more infused with value of the family. No Dudley or mean I liked the sequel to Fablehaven even better than Fablehaven itself. The author was able to flesh out the characters and each gained a lot of depth. They’re fantasy, not unlike Harry Potter but more infused with value of the family. No Dudley or mean aunts and uncles to contend with. And, I LOVE the reading guide at the end of the book where the author (Brandon Mull) probes the depths of reading comprehension with thought-provoking questions. The themes in the book are excellent too. For example, the girl is a rule-keeper and the boy is a curious mischief-maker, and one of the central themes is obedience. At the end you figure out that a measure of disobedience was necessary to set in motion the events that eventually lead to the ultimate demise of evil, which could not have happened otherwise. Fascinating!!! Book 3 comes out on my bday in April. 4. my kids would have loved this. Running toward danger is foolhardy. ... But so is closing your eyes to it. Many perils become less dangerous once you understand their potential hazards. If there was something I missed, it was diving back to the wonderful world of Fablehaven. And thankfully, this time, it brought more surprises than the first one. This, friends, is one of the greatest middle grade series I've ever read, partly because it contains every single mythological creature someone can hear about and partly because the plot is so clever and well spun that it can keep you at the edge of your seat. Rise of The Evening Star was the kind of book I wanted to close 2017 with. It contained unlimited adventure, brought new characters into my life, answered lots of questions the previous book had left, freaked me out a little (something I honestly didn't expect but loved) and most of all, made me savor the warmth and happiness middle grade books can bring for some reason. First of all, I adored how the artifact plot point started to unfold bit by bit, with many possibilities and new adventures rising, and wonderful new parts of the beloved magical preserve to roam through. The writing was as always incredible, with lots of jokes to lighten the mood but also a great description of everything, and voices of characters as unique as themselves. This book was darker than the first one, and there were a lot of moments when my jaw dropped and my heart started beating faster. I missed the innocence and whimsy of the first one, but this one was more adventurous and breathtaking and I loved that as well. I also noticed that Kendra and Seth, my children and my guides through this wonderful ongoing journey, are growing more and more accustomed to the way the preserve works, and are both growing, physically and mentally. The new characters, most of them trainers, were a breath of fresh air as well. I am excited to get to know them all better and learn more about their pasts, their motives and their strengths and weaknesses. I also loved the appearance of new dangers to focus on, secret pathways, groves, plenty of magical artifacts and potions and the role fear and courage played in this book. For some reason, every time I find myself talking about Fablehaven, I start blurting out how incredible it is and how much it is leaking fantastical adventures and journeys through magical forests at night, because that's just the truth. If you want to read something that will make you smile but will also give you a ton of other emotions, will keep you busy and will also be quick and 'unputdownable', this is for you ♥ If you are a fan of good world buildings and fantasy creatures of all kinds, be sure to give this one a look. I am excited to read the rest of the series, and I honestly wish I could have read this as a child because I would have been truly mersmerized. Kendra and Seth return to Fablehaven to discover more of what they don't know (and that can kill them) and save the day. Seth, now a year older, is a little wiser and doesn't find himself in as much trouble, but again, it is Kendra who comes through. By the way, in both books, while Kendra is the reluctant heroine, she is helped by others, so this isn't some supergirl of unlimited capabilities or powers. I get the feeling, in reading these first two books in the series, that these two young advent Kendra and Seth return to Fablehaven to discover more of what they don't know (and that can kill them) and save the day. Seth, now a year older, is a little wiser and doesn't find himself in as much trouble, but again, it is Kendra who comes through. I get the feeling, in reading these first two books in the series, that these two young adventurers have something more than just any old adult life ahead of them. That they will eventually become caretakers of the preserve is predictable, but I think it is more than that. Regardless, this read is much like its predecessor and stands alone surprisingly well, not needing to depend upon the first book. Regardless, I eagerly await the next installment in the series. This book is actually better than the first (and that's hard to do) both in character development and plot line. The plot line is focused with few subplots to confuse younger readers. 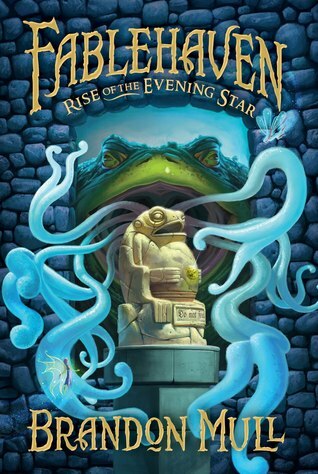 The events in Rise of the Evening Star pick up months after where Fablehaven left off. It continues the adventures of Kendra and Seth Sorensen as they become embroiled in an insidious plot by the forces of evil to obtain powerful, magical items and unleash a nearly unstoppable horror. 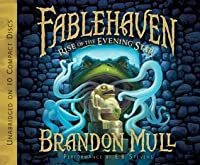 Mull deftly continues to add to the wonders of the world that is Fablehaven, giving the reader new exciting storyline and plots while nimbly threading in those from the previous book. His writing etches the framework The events in Rise of the Evening Star pick up months after where Fablehaven left off. It continues the adventures of Kendra and Seth Sorensen as they become embroiled in an insidious plot by the forces of evil to obtain powerful, magical items and unleash a nearly unstoppable horror. His writing etches the framework of what Fablehaven is and in a "Hitchcock-esque" manner, allows the reader's imagination to fill in that beautiful (and oftentimes deadly) world. The reader is treated to another encounter with the Satyrs, Doren and Newel, and they can't help but make one laugh. I reservedly compare them to Fred and George Weasley of the Harry Potter series, but with enough distinct differences to make them characters in their own right. All right. This book was a mess. By about page 300 I was just zipping through it, so as to have the vital information for the next installment, because A and C promised it gets better. Sigh. As usual, Mull delivers on imaginative world building, and the pace never slows, but his logical foundation is so weak I don't dare examine it--one too-direct breath could knock the whole thing over. (view spoiler)[Kendra's fairykind thing really got on my nerves after a while. The gift of tongues, fairy sigh All right. This book was a mess. By about page 300 I was just zipping through it, so as to have the vital information for the next installment, because A and C promised it gets better. Sigh. It feels wrong to wish for deaths and permanent injuries, but I'm kind of sick of magic fairy dust fixing everything. Seriously, I swear a magic toilet bowl that swallows the Society of the Evening Star and belches peace powder all over the world would be an easier story to swallow than his tidy clean-up jobs. GREAT writing. If you liked Harry Potter, you'll LOVE this one. The writing is tighter, the characters not as....angst-filled, a little more real, I think. The world is so beautiful and yet real-feeling. There is a great sense of morality without the SLAP of it in your face. NO force feeding here, just a delightful romp, jog and then a mad-dash to the climax in a world of majesty and power that is both magical and compelling. LOVED it. EVERY person (at least a dozen) I have recommended it to (even GREAT writing. If you liked Harry Potter, you'll LOVE this one. The writing is tighter, the characters not as....angst-filled, a little more real, I think. 4.5 stars.Five is reserved for books that really leave a emotional mark. This book was much more thrilling than the previous one,the fairies aren't all wimpy and stuff. What with Blixes ,the Sphinx and people like Coulter,it was a thrill reading this book. Besides unlike Bahumat (refer to first book)- who was supposed to be so powerful he could overthrow Fablehaven but still got whacked by a couple of Fairies- the Revenant was more of a horror.The part where Coulter turned out be wrong about the Ph 4.5 stars.Five is reserved for books that really leave a emotional mark. I think this book was better then the first. I am still not drawn to the main characters. I wish Kendra would take some more initiative and try to find out what her talents and powers are from being made fairy kind. There is so much build up to that and it is left hanging again in this book like it was in the first. I wish Seth would set a better example in the book, he is constantly disobeying, I was not thrilled with the things the children did in this book, i.e. sneaking out of their parents I think this book was better then the first. I am still not drawn to the main characters. I wish Kendra would take some more initiative and try to find out what her talents and powers are from being made fairy kind. There is so much build up to that and it is left hanging again in this book like it was in the first. I wish Seth would set a better example in the book, he is constantly disobeying, I was not thrilled with the things the children did in this book, i.e. sneaking out of their parents home to go with a stranger, sneaking out of his grandparents house with someone that could possibly be a traitor, his violent orders to Mendigo when they were being chased by the imps, ect. ect. I found Mull's imagination fun and the story more exciting then the first book. It was fun to read more about the objects within Fablehaven. I would like to hear more about what magical creatures are in Fablehaven, not just the evil ones. Something to make the place sound more magical, and not so evil. Certainly an improvement from the first book, but Seth is still an idiot. Kendra has become the most capable out of the both of them, but I can see Seth learning somewhat. I look forward to reading the next book in the series. A great continuation of the first book in the series. New characters and obstacles with and end that brilliantly sets up the next phase of the journey. Fablehaven is flat and forgettable. There is plenty of action and adventure, but it is soon forgotten when the book is finished. However, I did have to give this book the dubious honor of being labeled “rubbish”. Mull has an uncanny knack for writing offensive things about Indians. This book had children playing on a Foosball table populated with cowboys and Indians – complete with headdresses and bare chests. For those struggling to wrap their heads around this, an illustration is included on pa Fablehaven is flat and forgettable. There is plenty of action and adventure, but it is soon forgotten when the book is finished. However, I did have to give this book the dubious honor of being labeled “rubbish”. Mull has an uncanny knack for writing offensive things about Indians. This book had children playing on a Foosball table populated with cowboys and Indians – complete with headdresses and bare chests. For those struggling to wrap their heads around this, an illustration is included on page 166. Really?! Why couldn’t the figures on the Foosball table just be soccer players in red and blue?- Like on every other Foosball table? My other rant about Mull’s prejudice comments focuses on his use of albinism to mark recipients of a curse. Really? How can this type of rubbish be included in a children’s book? Albinism is a genetic health issue and not the result of magic. Mull’s books seem to be full of offensive and racist comments. He lacks cultural competencies and respect. I am going to start reading book three and I am willing to bet that it has something offensive, most likely about Indians, in it. This series is really unique and fun to read. I love the humor and all the interesting characters. I thought this one was better than the first, and I'm looking forward to reading more! I really enjoyed this story. I would have called it a "4.5 star - great!" story if not for two major annoyances: My Number One Annoyance was Seth. Annoyance Number Two was the ending. But more on these later. First, let's talk about the story and what I "really enjoyed." In this second outing with Kendra and Seth, they go back to Fablehaven at the end of the school year, as stated on the book jacket. But first, Kendra (view spoiler)[had to rid her school of a kobold who was causing mayhem. A man I really enjoyed this story. I would have called it a "4.5 star - great!" story if not for two major annoyances: My Number One Annoyance was Seth. Annoyance Number Two was the ending. But more on these later. First, let's talk about the story and what I "really enjoyed." Turns out, the (view spoiler)[statuette was the dormant form of Olloch the Glutton, a demon. And as he bit Seth when Seth picked him up, he's now going to have to eventually eat Seth. (hide spoiler)] I don't feel up to saying any more about this thread, but, perhaps needless to say, Seth comes through his encounters safely. I wasn't expecting the enemy agent to be who it turned out to be, but I can't say I was all that surprised, either. I was VERY glad that we never saw any of the drumants "on-screen," so to speak. After reading that "drumants look kind of like tarantulas with tails" on page 126. . .Well, I didn't need for anybody to actually encounter one to be VERY freaked out about them. I was just so relieved to reach the final page without anyone actually finding or seeing one, that I didn't even mind that the kids, et.al., were shown how to catch them but then never had an opportunity to try out that plan. "You should have Hugo throw you into the pool." The golem turned his head toward Seth, who shrugged. "Sure, that would be fun." Hugo nodded, grabbed Seth, and, with a motion like a hook shot, flung him skyward. Kendra gasped. They were still thirty or forty feet away from the edge of the pool. She had pictured the golem carrying Seth much closer before tossing him. Her brother sailed nearly as high as the roof of the house before plummeting down and landing in the center of the deep end with an impressive splash. Kendra ran to the side of the pool. By the time she arrived, Seth was boosting himself out of the water, hair and clothes dripping. "That was the freakiest, awesomest moment of my life!" Seth declared. "But next time, let me take off my shoes." “Hello," Newel said. "Look, Doren, we have visitors. Kendra, Seth, and ... Muriel's weirdo puppet. "....Newel grabbed Seth's hand and shook it vigorously. "Congratulations. You just found yourself a secret entrance."